Solenoid Switches and Relays are the main product ZM, and they were the first business of the Company. Nowadays the line range is composed of 700 models with applications in vehicles worldwide, with direct sales to more than 35 countries. 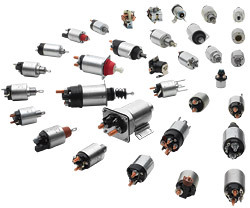 ZM Solenoids Switches and Relays are recognized as products of excellent quality and high reliability being supplied to the main automakers and parts assemblers that are present in the OEM market - Original Equipment Manufacturer. There is also a strong marketing presence in the Aftermarket, the segment of spare parts. Through this product the Company achieved significant technological advances allowing its expansion to other components and the definitive consolidation of its brand worldwide. See more Solenoids in our online catalog click here.